Though Bangkok has a (deserved) reputation as a traffic-choked, forever-frenetic metropolis, there are far more pockets of green packed into its environs than many realise. Here are some of our favourite Bangkok parks and green spaces. Perhaps Bangkok’s most famous park, the enormous Lumpini stretches 142 acres and earns itself comparisons to New York’s Central Park. The park dates from the 1920s and is an expansive pocket of greenery in an area of downtown Bangkok otherwise dominated by condos, shopping centres and embassies. Easily accessed by public transport – Silom and Lumpini MRT stations, as well as the Silom line’s Sala Daeng station on the BTS Skytrain, are all nearby – the park makes for the perfect spot to escape the city’s craziness and mingle with the odd water monitor sheltering in the shade beside the lake. Lumpini, like so many of Bangkok’s other parks, is popular with walkers, joggers and the evening crowds who turn up to impromptu aerobics sessions; there is also an inexpensive air-conditioned gym of which anyone can become a member, plus an outdoor pool and badminton, basketball and tennis courts. This only tips the iceberg of everything that Lumpini park has to offer, of course – it’s a kid-friendly place with multiple playground areas, and in the cooler winter months it plays host to the Bangkok Symphony Orchestra’s free weekly concerts. The park is open daily between 4.30am and 9pm. At pretty Benjakiti Park, a short distance from Asok station on the BTS and the MRT’s Queen Sirikit station, the focus is on the attractive flowers of just about every colour that line the green space. Popular with cyclists who use the park as the ideal location to escape danger on the city’s roads (a dedicated cycle lane means bicycle bliss, and there are bikes for rent too), Benajkiti only came into being in 2004 and was opened to mark Queen Sirikit’s 72nd birthday. With a lake at its centre and surrounded by modern skyscrapers – this is Bangkok, after all – the park offers a striking contrast of environments, as well as killer sunsets. A number of attractive fountains and playgrounds complete what is overall a less crowded park than Lumpini, great for escaping the crowds rather than joining them. The park is open daily between 5am and 8pm. Between Sukhumvit sois 22 and 24, close to Phrom Phong BTS station and a stone’s throw from the bustling Emporium and newer, even higher-end Emquartier shopping centres – together making up the so-called Em District – is the low-key Benjasiri Park, popular with those looking for a little solitude amidst its shady trees, playground and central lake. The lake also attracts those who come to feed the population of turtles that call Benjasiri home, as well as the usual exercise fanatics who join in nightly exercise classes; Benjasiri also boasts a basketball court, skate park, tennis court and multi-purpose sports court. Less well known is the uncrowded public swimming pool on the southeast corner of the park; you can become a member for just 40 baht plus a copy of your passport’s photo page, two passport photos, and a medical report from a local hospital. It then costs 15 baht per swim session. The park is open daily between 5am and 9pm. In the northern reaches of Bangkok and just steps from the famous and sprawling Chatuchak weekend market, Rot Fai Park – translating as the train park, owing to its previous ownership by Thailand’s state railway company – has a pleasant landscape of gently rolling hills, plenty of wildlife to observe, and even Bangkok’s only butterfly house (closed Mondays) to take in. A lake offers kayaks and paddle parks, but there’s plenty of space to explore even away from the water, given that the park itself is huge, stretching over 150 acres. It’s also popular with cyclists, owing to a dedicated 3km bicycle track; there are also bikes for rent at the park’s entrance. Of course, this being a Bangkok park it’s also home to plenty of exercise enthusiasts, including those walking and jogging, while there are tennis courts, basketball courts and a playground on offer too. It’s also possible to rent straw-like mats if you want to cosy up for the afternoon and tuck into a picnic. 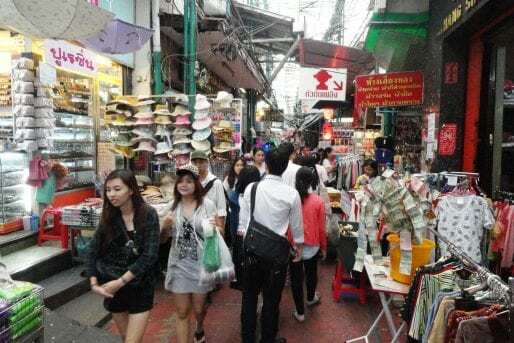 To get here, take the BTS to Mo Chit or the MRT to Chatuchak Park; it’s about a 10-minute taxi or motorbike ride away. The park is open daily between 4.30am and 9pm. Opened in 1997, the Princess Mother Memorial Park is a real pocket of tranquility in the Khlong San area of Bangkok’s Thonburi district, and was established in memory of Somdet Phra Srinagarinda Boromarajajonani, Thai King Bhumibol’s late mother, also known as Somdet Ya. The princess mother was born into an ordinary family of goldsmiths, and later became a nurse – her family’s home, long since demolished, was located in the area where the park now stands. Land in the area was donated to the project, and the park now includes a replica of the princess mother’s childhood home, as well as a small museum with two exhibition halls and a gallery of photographs by Thai artists. For many, sitting on a beach under the attractive, tree-lined trellis is the perfect respite from the day-to-day heat and frenzy of Bangkok life, and you’ll find plenty of older locals using the space to catch up and have a good gossip. Located on Soi Somdej Chaophraya 3 alley, the most convenient public transport connections are the Memorial Bridge or Ratchwaong express boat piers; from either, you’ll need to take either a cross-river ferry or a road bridge across the water, before continuing on foot. The park is open daily between 6am and 6pm; the museum is open from 8.30am to 4.30pm, except on public holidays. We visit the Princess Mother Memorial Park on our Diversity & Harmony walking tour. Just across the road from the rear end of the Grand Palace and a stone’s throw from Wat Pho, Saranrom Park is at once packed with Thai history and yet surprisingly overlooked by most visitors to, and even residents of, Bangkok. Once part of the grounds of Saranrom Palace built in 1866 during the reign of King Rama IV, the park was later turned into a zoo before housing the Ministry of Foreign Affairs’ offices and being used to host visiting foreign dignitaries and royalty. There are also tales of it being used in the plotting of the 1932 coup that led to the end of Thailand’s system of absolute monarchy. Now under the control of the Bangkok Metropolitan Administration, Saranrom Park retains its distinctive style as a botanical park, with a mix of Rattanakosin-era and western influences. A monument at the southern end of the park is dedicated to Rama V’s wife and daughter, who died in a boating accident on the Chaophraya river, while the park also has weight-lifting and table tennis areas, as well as plenty of ponds and the original pavilion previously used by military bands. The park, on Rachini Road and a short walk from Tha Tien and Tha Chang boat piers, is open daily from 5am to 10pm; Wat Ratchabophit temple is also close by. Where do you go to escape the frenzy of Bangkok? Which of the city’s parks and open spaces is your favourite? Let us know in the comments! Photos by istolthetv; Mark Fischer; Johan Fantenberg; Rushen; Chris Wotton; Aaron Toth.